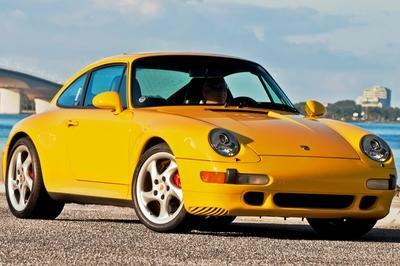 The Porsche 911 has always been and will always be one of the most coveted sports cars on the market. Badges don’t matter. Names don’t matter. Heck, power and performance don’t matter. There are only a handful of cars that are above all of that, and the 911 is one of them. 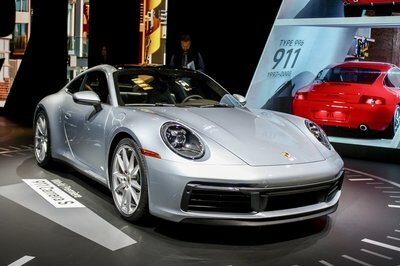 So, can you imagine what happens if Porsche decides to break out a special edition 911 Turbo S that’s not only super limited in number, but is also described as the “most powerful and unique 911 Turbo S ever created?” Well, the 911 Turbo S Exclusive Series is happening and it’s everything the 911 should be, and then some. On the surface, the timing of the 911 Turbo S Exclusive Series’ release is a bit surprising considering the height of auto show season has just concluded. But the beauty of this release is the surprise that comes with the timing. 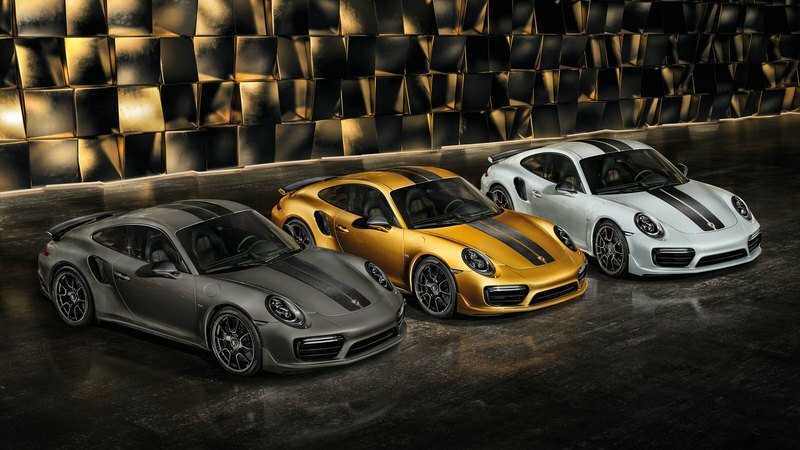 Porsche isn’t launching the limited edition 911 Turbo S for no other reason than to celebrate the renaming of Porsche Exclusive to Porsche Exclusive Manufaktur. 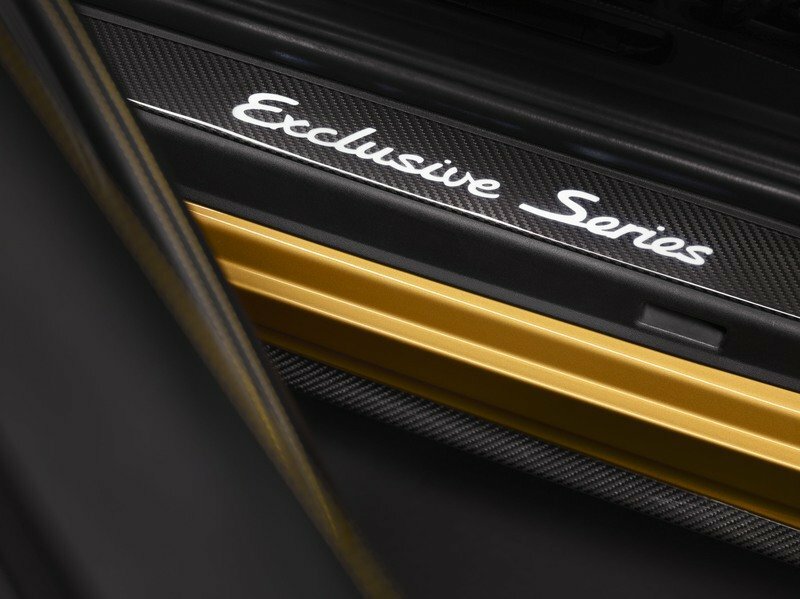 Naturally, such an occasion deserves a physical manifestation of its significance and since Porsche Exclusive Manufaktur was heavily involved in creating this limited-run 911 Turbo S, it’s only right that the car is released to coincide with the start of a new era for Porsche’s in-house personalization division. 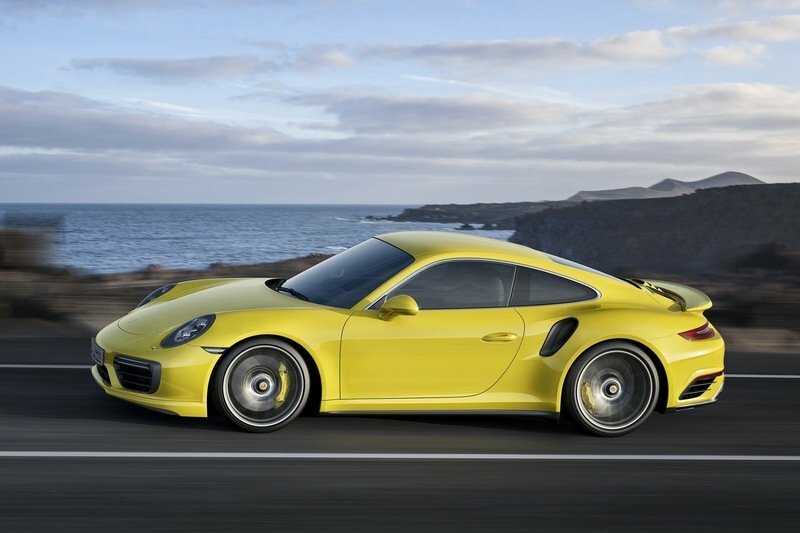 Prepare yourselves, because the 911 Turbo S Exclusive Series just might be the most desirable 911 ever created. 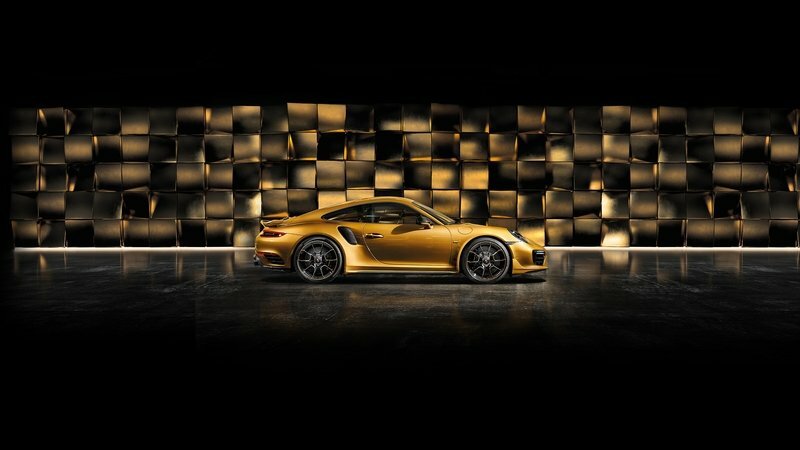 Continue after the jump to read more about the Porsche 911 Turbo S Exclusive Series. Considering Porsche’s claim that this is the most powerful and unique 911 Turbo S ever created, calling it “special” sounds like a bit of an understatement. The truth is that Porsche is right on the money because there are so many things about the 911 Turbo S Exclusive Series that counts as special. Let’s start with the exterior where the Golden Yellow Metallic finish counts as an exclusive offering. I can’t stress that enough, too, because this car is the only Porsche model that will wear this specific color. No more, no less. Move beyond the striking paint finish and the next item to get your attention is the racing stripes that run the length of the car, from the hood and straight through the roof. Thing is, they’re not your stock painted stripes either. They’re actually made from carbon that’s been woven to take the shape that they’re in. The stripes end on the back section of the roof, but move past that and you’ll see that the ram-air scoop at the back is also made entirely from carbon fiber. And if that’s not enough, even the hood, roof, and the side skirts are also made from the premium and lightweight material. Once you’ve gotten your fill of the carbon fiber overload throughout its body, you can move to the back of the 911 Turbo S Exclusive Series and see that it’s also wearing an entirely new rear apron that’s a lot more pronounced in its appearance than the one found on the standard model. If you can spare a few seconds and remove your gaze from the car’s body, you can step inside the interior where the upgrades are just as exclusive. For instance, it’s hard not to get drawn into the predominantly black nature of the cabin. 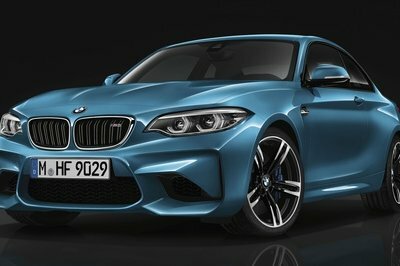 This treatment sets an aggressive tone for the rest of the cabin’s features. One that stands out is the Golden Yellow racing stripes on the inside layer of the 18-way adjustable sports seats. The eye-catching nature of this particular shade creates a dramatic break to the monotony of the interior. Add the seams and the Turbo S stitching on the headrests – also in Golden Yellow – and the predominantly black look of the interior is suddenly brought to life by the infusion of color brought about by this dynamic shade. 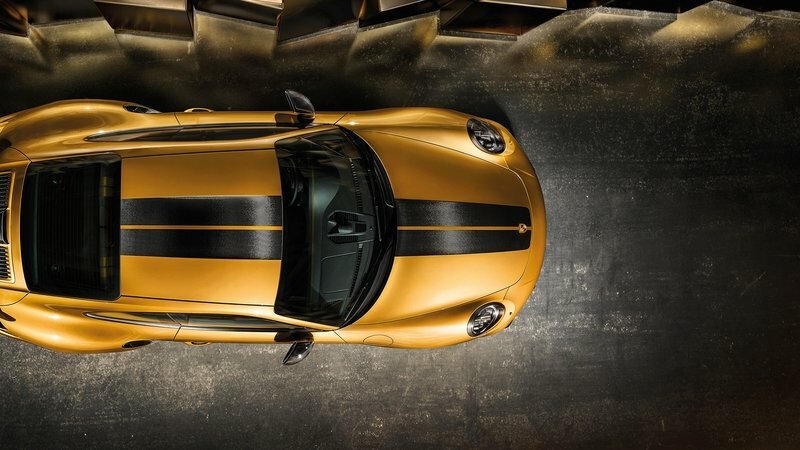 Even the roof lining, which is made primarily out of Alcantara, features the Golden Yellow double-stripe look. In case anyone’s looking, the cabin also comes with a fine cooper thread that’s been integrated into the trim strips of the carbon in the interior. 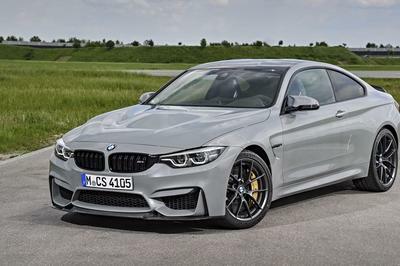 And for authenticity’s sake, the cabin also features a small plaque on the front passenger side denoting its specific number and status as an “Exclusive Series” model. The last notable special edition item here is the carbon door entry guards, which themselves come with illuminated Exclusive Series lettering. 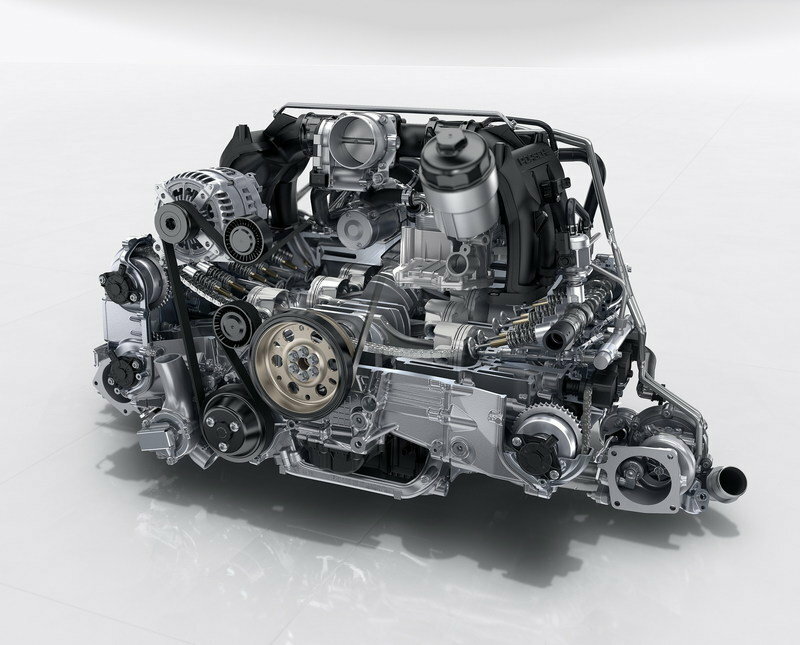 Note: Engine of the standard Porsche 911 Turbo pictured here. As special as the 911 Turbo S Exclusive Series has been so far, what really sets it apart from all other Porsche 911 models can be found inside its 3.8-liter twin-turbo flat-six engine. It’s still the same powertrain as all other 911 Turbo models, but it does come with the advantage of being “upgraded” to produce a total of 607 horsepower and 553 pound-feet of torque, making it the first-ever factory-built 911 Turbo S variant to exceed 600 horsepower in history. Considering how notoriously conservative Porsche is in really maximizing the power potential of its flat-six engine, the fact that it accommodated adding almost 30 horsepower to the 911 Turbo S Exclusive Series is in itself earth-shattering news. Performance numbers stay largely the same as the 911 Turbo S Exclusive Series’ acceleration time to 60 mph sits at 2.9 seconds while the top speed is also similar at 205 mph. Regardless of what those numbers say, there is the appeal of having a 911 Turbo S that comes with more than 600 horsepower. That number is worth the price of what you’re going to have to pay for it. 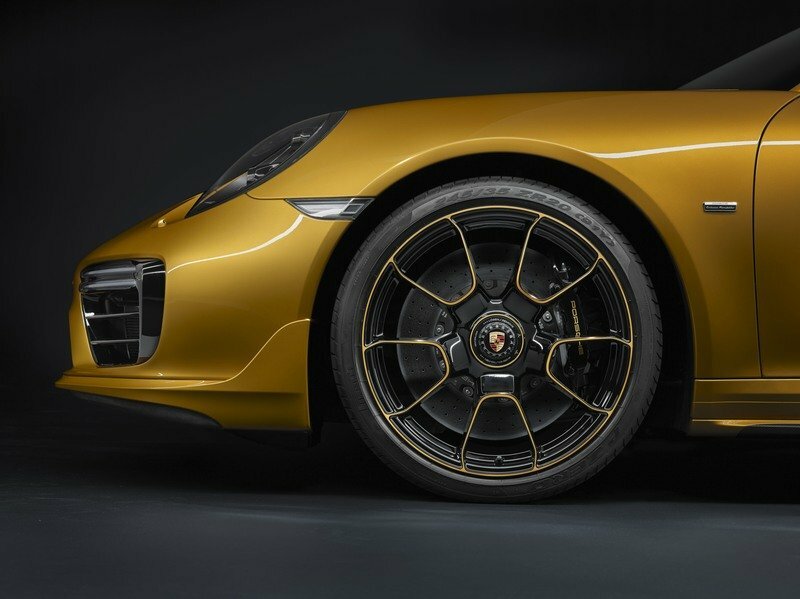 The technically-inclined customer will also be happy to know that in addition to all these sweeping upgrades to the exterior, interior, and engine of the 911 Turbo S, the Exclusive Series model also gets the Porsche Active Suspension Management (PASM), Porsche Dynamic Chassis Control, and the Sport Chrono package as standard features. 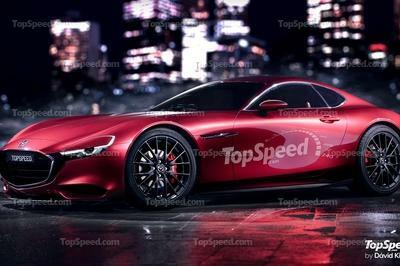 All these tech features are credited for complementing the increased power from the flat-six engine by ensuring that the car rides as well as it’s supposed to, considering all the changes it received. 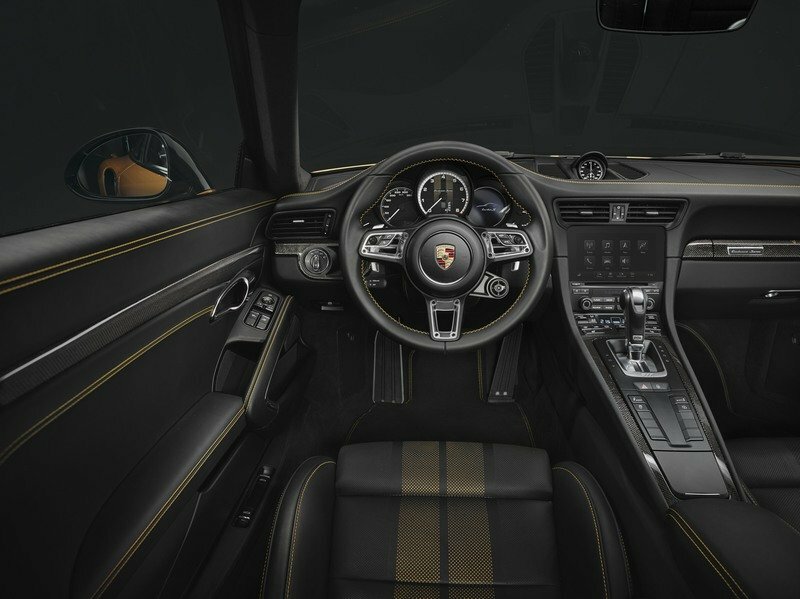 All of these features are enough to qualify the 911 Turbo S Exclusive Series as a must-have special edition model. But since Porsche raised the expectations for this model, it still wouldn’t be enough to say that these upgrades are already all that. Fortunately, they’re not because having the status of being the “most exclusive” 911 Turbo S ever created means that extra features are also in order. 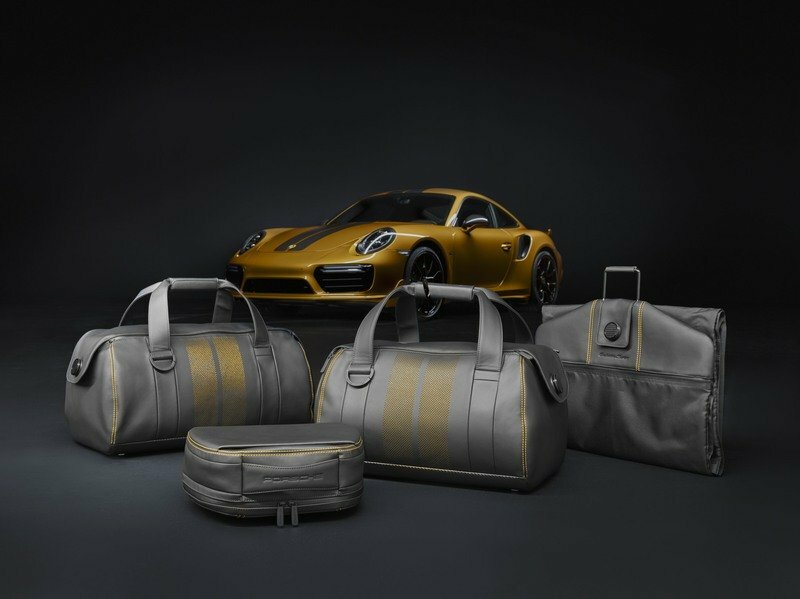 For an extra cost, Porsche is also offering customers who do buy the car a unique luggage set to go with the car itself. The set is made up of a day bag, suit bag, and a pair of hold-alls, and are made specifically to fit into the luggage space available in the car. If the luggage set isn’t enough, customers can also avail of an exclusive Chronograph that Porsche Design developed specifically for the model. The watch itself comes with a lightweight titanium housing to go with a black titanium carbide coating. Inside, the dial is made from carbon, the same material that was used in the carbon weave stripes on the actual car. Even the watch’s rotor design is inspired by the wheels on the car and the winding mechanism comes with Porsche’s own central lock. And to no one’s surprise, the unique colors of the 911 Turbo S Exclusive Series are also well-represented in the 500-piece Chronograph timepiece. Porsche is charging at least €259,992 for the car in its home market of Germany. Those who do find themselves with a clear line of purchase to the 500-unit exclusive 911 Turbo S can also add another €9,950 ($11,200) to their bill by getting the Porsche Design Chronograph 911 Turbo S Exclusive Series and another €5,475 ($6,165) for the luggage set. 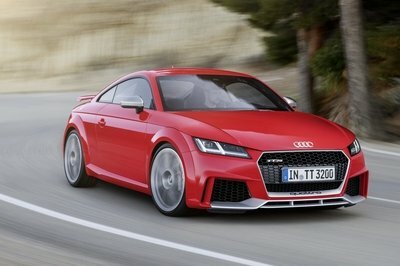 Here in the U.S., the Exclusive Series Coupe starts out from $257,500. 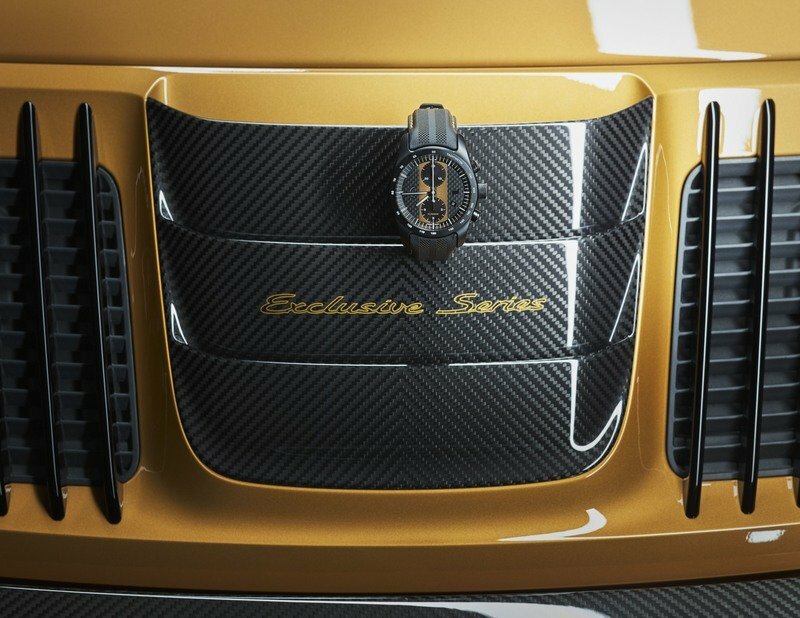 The Chronograph 911 Turbo S Exclusive Series is available as an option here as well, however, pricing has yet to be announced. The five-piece luggage set will set you back an extra $6,324. To put all of this into perspective, the base 911 Turbo S starts out at $188,100, which means the Exclusive Series Coupe comes at a premium of $69,400 here in the U.S. 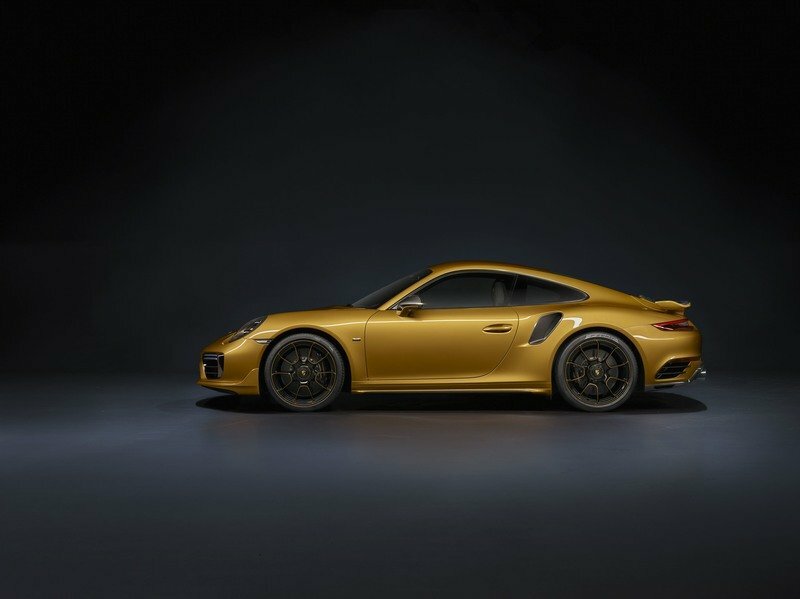 It goes without saying that whoever ends up with any one of the 500 units of the Porsche 911 Turbo S Exclusive Series will have one of the most special 911 Turbo S models ever created. It won’t come cheap, but if the funds and interest are there, then I can’t think of anything better to spend almost $300,000. 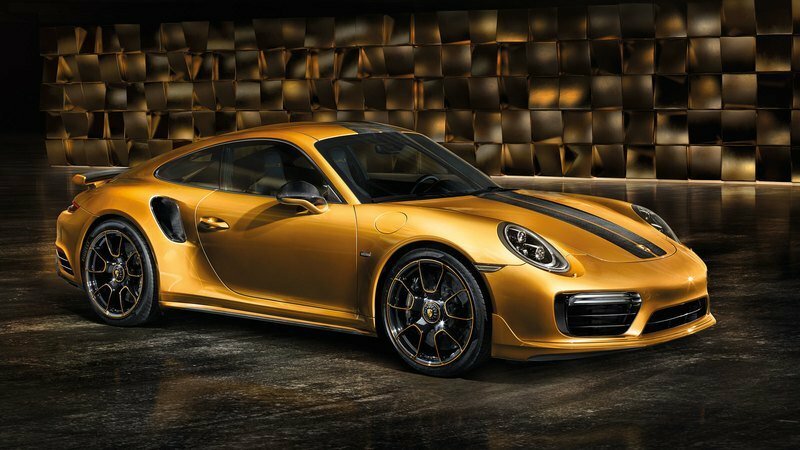 At the very least, you’re looking at a special edition 911 Turbo S that has “future collectible” written all over it.